Under its administration, there are 15 counties, namely Huangping (huáng píng 黄平), Shibing (shī bǐng 施秉), Sansui (sān suì 三穗), Zhenyuan (zhèn yuǎn 镇远), Cengong (cén gǒng 岑巩), Tianzhu (tiān zhù 天柱), Jinping (jǐn píng 锦屏), Jianhe (jiàn hé 剑河),Taijiang (tái jiāng 台江), Liping (lí píng 黎平), Rongjiang (róng jiāng 榕江), Congjiang (cóng jiāng 从江), Leishan (léi shān 雷山), Majiang (má jiāng 麻江), Danzhai (dān zhài 丹寨), and 1 county-level city - Kaili (凯里). Seat of the Prefecture Government: No.11, Beijing Dong Lu, Kaili City. Before the Spring and Autumn Period (770BC-476BC), Qiandongnan was known as a place of southern barbarians and partly belonged to the Chu (chǔ 楚) Kingdom and a local ethnic regime. It made great progress in development during the exploitation of the Miao region in Ming Dynasty (1368-1644). 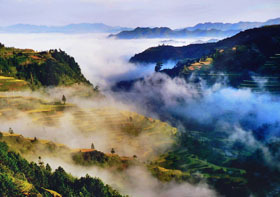 Physical Features: Qiandongnan lies in the transition area from Yunnan-Guizhou Plateau to hills and basins in Hunan and Guangxi. Karst and eroded landforms are widely distributed in the prefecture. Its general terrain is higher in the north, south and west while lower in the east. Western and northwestern part of this prefecture is medium and low mountains, and its eastern and southeastern part has complex distributions of low mountains, hills and basins. On the whole, mountainous region occupies over eighty-seven percent of the prefecture's total area. This area enjoys a subtropical humid monsoon climate bearing some features of plateau climate. Average temperatures of the coldest January and hottest July are respectively 5-8°C (41-46.4°F) and 24-28°C (75.2-82.4°F). The rainy season usually lasts from April to October, mainly concentrating on spring and summer. Visitors can visit there in spring, summer and autumn. It is notable that a spread of half a year in Kaili is in rainy season. A raincoat or umbrella should be carried for this trip. Ethnic minorities in this area have a population of 3,640,000, over eighty percent of the prefecture's total population. Miao and Dong minorities are the biggest groups. The colorful traditional festivals and local folk customs are the highlights of the prefecture. Road-block drinking is the first ritual when the hospitable Miao people welcome guests. From the foot to the gate of the village, there are usually twelve barriers with full dressed Miao youths pledging wine to visitors. 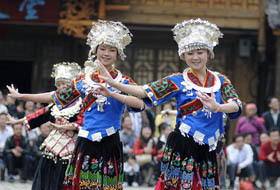 Kaili is praised to be the town of a hundred festivals. 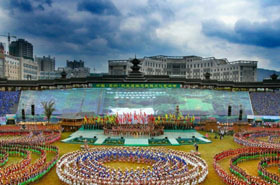 International Lusheng (lú shēng 芦笙) Festival held annually should be the grandest. The festival aims to show the ethnic cultural of the region as the birthplace of Lusheng, the reed-pipe wind instrument. 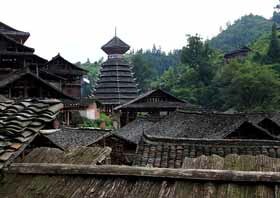 Sanbao Dong Villages (sān bǎo dòng zhài 三宝侗寨) is located in Chejiang Township (chē jiāng xiāng 车江乡) of Rongjiang County (a small county of Southeast Guizhou ). It lies in the biggest intermountain basin of Southeast Guizhou with Douliujiang Rive (dōu liǔ jiāng 都柳江), which is the largest river throughout Rongjiang County, passing by, boasting rich natural resources and beautiful scenery. Sanbao means “Three Treasures” in Chinese. Sanbao Dong Villages comprises of Sangbao Dong Village, Zhongbao Dong Village and Xiabao Dong Village, stretching over fifteen kilometers. It is the largest inhabiting region of Dong ethnic people in China. 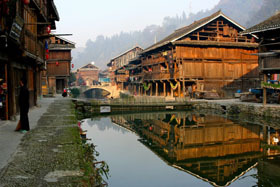 Besides the common characteristics of Dong villages, such as unspoiled natural environment, row upon row of wooden houses in close order, well preserved primitive ways of living (every family doing farming, hurting and weaving cloth), it features the largest group of ancient banyan trees in China and a lot of Drum Towers. After entering the village gate inscribed with “Sanbao Dong Village” in Chinese, getting to the bank of Duliujiang River (the largest river throughout Rongjiang County), tourists will see a large group of age-old banyan trees stretching over one kilometer, which is rare even throughout the world. Most of them are over 300 years old, planted during the reign of Emperor Qianlong of Qing Dynasty. Their branches connect and their roots entwine with each other, which Is really marvelous. There is a pebble route passing by the banyan tree group, called “Flower Street” by villagers. At the end of the pebble street, there is a sculpture consisting of a man and a woman. The man is called Zhu Lang (zhū láng 珠郎) and the woman is Niang Mei (niáng měi 娘美). As the largest inhabiting region of Dong ethnic people in China, Sanbao Dong Villages of course boast a lot of Drum Towers. Among them, Chezhai Drum Tower (chē zhài gǔ lóu 车寨鼓楼) is the most famous. It was built in the three year of the Reign of Emperor Guangxu (guāng xù 光绪) of Qing Dynasty (1877), with a history of over 130 years. It is 15 meters high, covering an area of 246 square meters. It is a miracle that the whole drum tower is built without a tiny nail or rivets to be stable and firm and weather over a hundred of years. Besides, there are nine Sama Temple in Sanbao Dong Villages (Sama is the goddess of Dong ethnic people). When mention the delicacy of Sanbao Dong Village, the Preserved Fish in Dong Style should be on the top of the list. Every family make preserved fish by their unique recipe. It is really worth tasting. Lying in Leishan County in Qiandongnan Region of Guizhou Province, Xijiang Miao Village (xī jiāng miáo zhài 西江苗寨) is the only village owning over one thousand Miao households in China. Xijiang county seat is about 37 kilometers (23 miles) from the Miao village. Embraced by the surrounding verdant mountains, the village has a primeval and natural flavor, far away from the influence of modern industry civilization. The 1,285 Miao stilt houses are built along the contour of the mountain layer upon layer. What an imposing sight it is! At noon, pieces of the red wood board look brilliant in the sunlight, and in the evening, cooking smoke is spiraling from every kitchen and forms into a white belt around the mountain's waist. Industrious Miao People are living a peaceful life in this marvelous land. There is also a silversmith village in the county, making silver ornaments of Miao minority by hand. 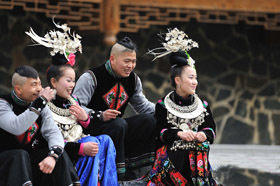 Xijiang has the most intact and original ecology of the Miao, being the ideal place to admire and study the traditional culture of Miao minority. 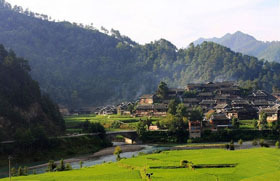 Xijiang Miao Village, due to its unique Miao culture, has been honored as "the Gallery of Miao Culture". Walk into Zhaoxing Dong Village (zhào xìng dòng zhài 肇兴侗寨) - the largest Dong Village in Qiandongnan in Guizhou Province, and you will feel like the clock is being turned back. All the buildings in the village are wooden-stilt houses. This is a picturesque village noted for the beautiful natural sights and unique ethnic flavor. It is surrounded by verdant mountains with a crystal stream running through. The drum tower is the mark of Dong village, that is to say, every dong village has its own drum tower, and Zhaoxing is no exception. Its five drum towers are known far and wide for their unique styles. Each of them has a particular name that is Ren (rén 仁) - benevolence, Yi (yì 义) - righteousness, Li (lǐ 礼) - courtesy, Zhi (zhì 智) - wisdom and Xin (xìn 信) - faithfulness respectively. They differ in method of construction, external appearance, height and size. The flower bridge is another architectural wonder in Zhaoxing. The creative Dong People built corridors which provide benches for passers-by to have a rest or run for shelter. It is astonishing that there is no single nail on the whole bridge. With the firm joint of mortise and tenon, the bridge is strong enough to withstand the region's strong winds and rains. In the village, everything is simple and far away from the influence of modern city life. Only the murmur of the little brooks, the happy songs of Dong People and the rhythmic beating of the rod for laundry will provide the occasional sounds of daily life. The verdant mountains, simple but elegant houses and the smiling faces of Dong People will greet you and complete this natural feast for your senses. Leigong Mountain (léi gōng shān 雷公山), the highest mountain in Miaoling (miáo lǐng 苗岭) mountain range and the highest mountain in southeast Guizhou , lies in Leishan County, 40 minutes drive from Kaili (a famous tourism city of Guizhou province). It consists of ten peaks, which are all over 1800 meters high, the highest reaching 2178.8 meters. It is the holy mountain among Miao people and rumored as the place where the God of Thunder ("Leigong" in Chinese) lives. It was announced as a national forest park at the year 2003, covering a total area of 47300 hectares. It boasts a large number of rare animals and luxuriant virgin forests which covers a total area of 26199 hectares and is the first and largest Taiwan Fir (a rare species of tree throughout the world) Natural Reserve. The summit of the Leigong Mountain is like a 350-meter-long platform which is big enough for many tourists to camp. The climate on Leigong Mountain is typically rainy and wet, and changes constantly. It is the perfect place to enjoy sunrise and sunset (of course at a fine day) and also a famous summer resort for it feels like autumn during midsummer. 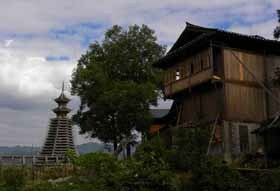 There are lots of Miao villages scattered throughout the Leigong Mountain National Forest Park. The ancient ethnic buildings, beautiful and unique ethnic costumes, fascinating singing and dancing, interesting ethnic festivals and delicious food become the highlights of Leigong Mountain National Forest Park. After a long development, the transport around and in Leigong Mountain National Forest Park has become very convenient. It is only 40 minutes drive from Kaili to it and two hours and a half drive from Guiyang (the capital of Guizhou Province). 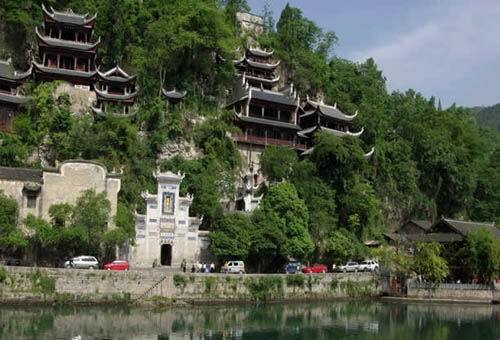 There are also direct buses and Flights which can bring tourists here from Guilin (beautiful tourism city of Guangxi Province) and Zhangjiajie (renowned tourism city of Hunan Province). Southeast Guizhou region is relatively less developed but transportation in the area is not as harsh as recorded on many guidebooks. A comprehensive network of highway centered on Kaili-the capital city of the region has been built to connect almost every village in recent years. 2 of the best options to getting there is: a.) from North, Take a train to Kaili and change to coach to the mountainous villages; b.) 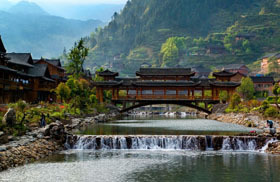 from South, Take Flights or train to Guilin , and then coach to these villages. On the way you can visit Longsheng, Sanjiang. The best way to get around is to travel from village to village. Although roads are built recently to connect every village together, bus conditions can always make your trip uncomfortable. And limited transport and lack of information makes independent traveling a more difficult thing. One of the good solutions is that to hire a car and a tour guide who knows the areas, know the culture and history that behind the villages. 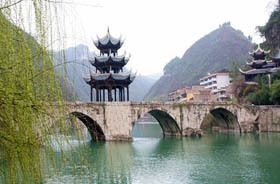 Kaili is about two hours drive from Guiyang via expressway. It does not have its own airport. Visitors can have the aid of the Guiyang Longdongbao International Airport. 1. Traveling in winter, it can be quite cold, so travelers are advised to take good warm clothing, including a hat and gloves. 2. Some of the footpaths into several of the villages can be quite muddy and slippery, so good footwear is essential. A second pair of sport pants is a good idea, as there is a lot of mud, and the occasional slip is almost inevitable. 4. Hotels in small towns such as Rongjiang and Congjiang are of significantly lower standard. Heating is sometimes not available and western style toilets usually unavailable.